I liked Toy Commander, I thought it was one of the best launch titles on the DC, it mixed hard-core military warfare with…toys? Sounds strange but No Cliché managed to pull it brilliantly, and became for me at least, one of those unexpected hits that you normally wouldn’t give a second look. Well, it’s spin off time, and (as you have probably already read in our news section) all for charity this Christmas! Now what can you get for £4.99? Certainly not even an Nintendo 64 game, unless you are lucky, well you got the old PC stuff, some cheap PlayStation sale game from Woollies, or a brand spanking new Dreamcast game with full online gaming!!! I know which I’d choose! The worlds cheapest full price DC game has arrived, and for your £4.99 you get everything you’d expect from your average £40 DC game, a lovely case, a hefty instruction manual and the game itself of course, all I was expecting was a normal CD case like with Planet Ring. Well pop the GD into the drive and you’re away with Toy Racer! 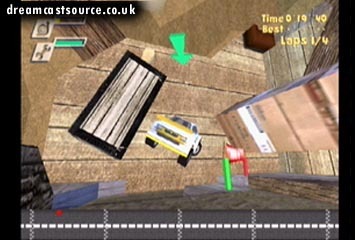 Fans of Toy Commander will instantly recognise the style of the game, right down to the bleeps when you select an option. You have Training mode to practice on the 4 tracks from different rooms in the house, then there is split screen mode, and online race, and then an options menu. 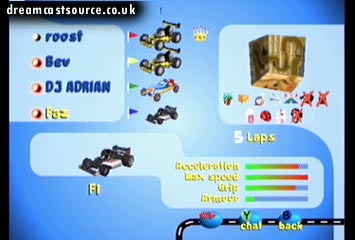 Sadly, there is no single player racing, (It’s a shame as I’m sure it would have been easy enough to port the computer AI from Toy Commander in the Grand Prix races, but then they wouldn’t get as many people online so it all makes sense in the end) the only thing you can do without either racing a mate or plugging in the phone cable and logging on is practice and race against your ghost. 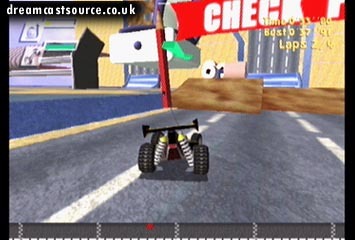 Graphically, the game is identical to Toy commander, the textures are pretty poor, as is the smoothening of textures is poor, so as the markings on the road go into the distance, the quality degrades in clear places making it looks pretty dismal at times as the graphics engine clearly wasn’t designed for racing games, and this particularly shows on the 1st person perspective. However, one pleasing addition from Toy Commander is the new 60fps frame rate, (that is double that of Toy Commander) which really makes the game run smoothly, which compensates slightly for the graphics. Well it was, until I realised that this only applied to training races, all split screen races, and online races are still 30fps. Sounds and music are taken from Toy Commander (Sorry to have to make so many comparisons to it, but when I said it was a spin off, I wasn’t joking, it might as well be an add on disk for it) and although very limited do the job. 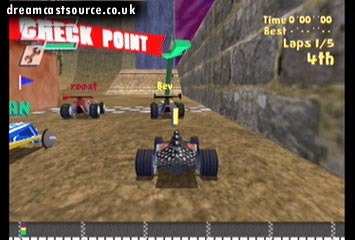 The gameplay is where Toy Racer well and truly stumbles, at least in split screen mode with 2 players, unless you are evenly matched, there is no point what so ever. In 4 player mode though, it can prove to be a lot of fun as you blast the living day light out of your friend sat next to you with a pen or pencil (missile) but, you only have this fun if you are a) playing on a large TV or b) have very good eyesight as sometimes trying to work out what is going on, on the screen is near impossible. Online racing, on the other hand is absolutely fantastic! Fast, furious and frantic are just some of the words to describe it. What’s more, it’s really easy to get into a game, even 10 minutes is enough for a few races. All you have to do is select Network on the options screen, let the modem dial out, type your DreamArena password and pick a name. Then just enter a lobby (preferable English one) and join a game. Or host your own. The best part online racing is that each race is different, each opponent races with a different style and level of talent, and really, shows you just why online gaming is the way to go. Not even the most sophisticated computer AI can come close to this! Races are relatively lag free and there is only the odd occasion where you’ll think that you’ve won a race only to realise that it was lag that showed your opponent as being behind you. There are also online cup races you can have where you win extra vehicles if you win. Overall, in split screen really average, but the mere fact that it’s less than a fiver is a good enough reason to get it, then add the online mode and it makes it worth around £15 plus, you get a feel good factor from the knowledge you’ve just donated £1 to charity! Nice friendly chat after a race.. if only I had a keyboard!! If any game can keep me playing 3 hours solid despite the fact that it's costing 1p a minute, it's gotta be good! It's a cool experience too.. after a close race, it's fun to chat to whoever you've just lost to or beaten.. or ask the French guy why he was driving backwards! 5 Practical. Nothing more, nothing less! Gameplay 8.5 Online it is fantastic to play, and many an hour can pass with you blissfully unaware racking up the phone bill, offline however…need I say more? 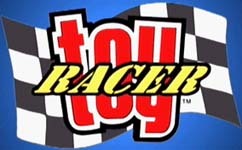 With every race totally different, and new vehicles to win by completing cup races Toy Racer has a replay value few other games can offer. "Online it’s got the gameplay, and that’s what counts, making Toy Racer a game all DC owners should have!" >>Discuss this game and share your opinions in the Forums! Extras Online racing, only £4.99!